Delightful stalk! Love the left-leg-long-sock look, and sooooo appealing an expression at the end, before deciding that the camera/human being just isn’t worth further attention! When we visited Tall Ships Race in Kristiansand, we stayed at the Comfort Skagerak Hotel. 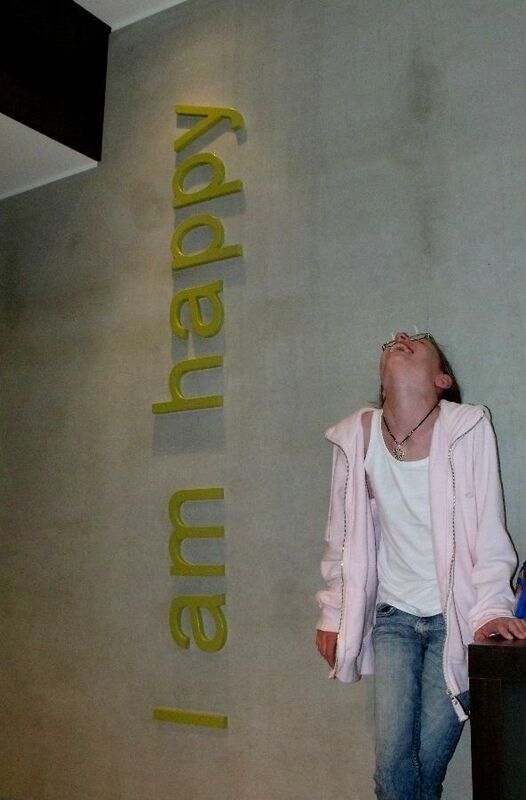 Each room had their themes and ours had "I am happy" as its theme. The first post I looked at this morning, and what better way to start the day . . . “huge smile” is only just adequate a description! It’s a wonderful image Svein. Reminds me of some of Alix that Elizabeth has taken, and I'll say to you what I said to her: what a precious gift that photo is for your daughter to look back on in years to come. Here is another funny one for cat people. Brilliant... being the cat lover I am, thank you so much! Just last night I saw our cat our cat doing something similar with one of my old shoes. I suppose nature has given them some "practice routine" programmed into their brain to keep them in proper shape for hunting. Just last night I saw our cat our cat doing something similar with one of my old shoes.... . The humour of the cartoon is so much more brilliant for being closely rooted in observation of real cat behaviour isn’t it. It gave me another laugh yesterday on seeing a request, regarding our recycling of cardboard waste, that boxes should be flattened before being put out for collection. I immediately thought of Simon’s Cat, momentarily imagining a whole local-council-employed cat workforce busy flattening boxes! Oh Pilotdane, I just sat and laughed my way through that video. I agree with Seagull, it is just absolutely cat-typical, even to the few seconds of displacement activity licking its paw while it decides on the next move.